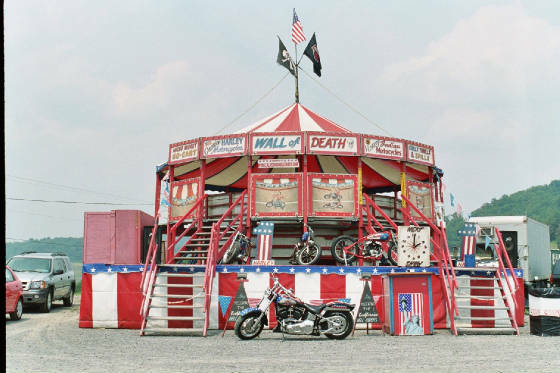 What you see before you, called "The Wall of Death" is also known as a 'Motordrome'. Motordromes started out in the early 1900's as board track racing, consisting of mile long racetracks all around the country. The entire race track was made of wood. The turns went into long steep, almost vertical sweeps around the racetrack. The steep corners and long straight aways allowed the riders to reach very high speeds. The riders fought for position as they raced around the board track. The sport was very dangerous and was eventually outlawed due to a fatal accident involving a few racers as well as spectators. Although this type of racetrack was banned, the riders still had an undying passion for the sport, so they created their own board track. This time they took out the straight aways and made the track 90 degrees perpendicular to the ground and instead of competing against each-other, they worked together to create a show where people and families could come to watch in a much safer environment. This particular Motordrome was built in 1962 by a gentleman named Joe Boudreau of Ocean Grove, Massachusetts. In Joe's lifetime he built three dromes. This particular one is the last of the three he built to replace one his father had built back in 1929. Joe's father, Pappy, retired and Joe kept the show going until 1976. When Joe retired from riding the wall sat in lot disassembled until Wayne Campbell, who rode with Joe from 1972 until the show folded in 1976, brought it back to life. Wayne spent a year doing repairs and a year training riders then hit the road in 1981. Don Daniels Sr. started riding for Wayne in 1982 and bought it from Wayne in 1984. Our walls stand 14 feet high and is 24 feet diameter. We are one of only three who continue to tour in the United States today . If you went overseas you would see a lot more of these types of shows.
"' 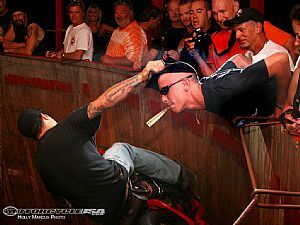 It is the love of the sport and the rush of the ride. That is what keeps the Motordrome alive.'"